The Web Media API Snapshot 2017 Test Suite, developed by Fraunhofer FOKUS under contract from CTA WAVE, has been published recently. 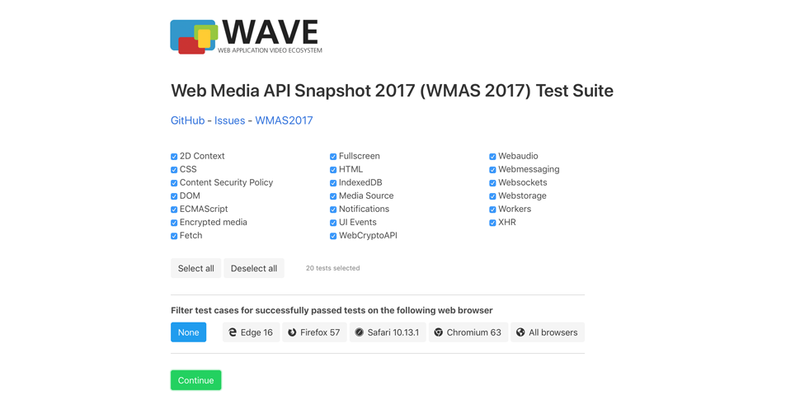 The Web Media API Snapshot 2017 (WMAS2017) is a specification that is "updated at least annually to keep pace with the evolving Web platform". It is developed by the the WAVE (Web Application Video Ecosystem) Project, hosted by the Consumer Technology Association (CTA) and targets manufacturers of devices including laptops, mobile phones, set-top boxes, media sticks and boxes, and Smart TVs. The WMAS2017 Test Suite is the first public toolset from the CTA WAVE project designed to test that HTML user agents in consumer products are based on recent releases of browser code bases. WMAS and the Test Suite will be updated annually to the latest Web APIs. The tests are based on code in the existing W3C Web Platform Tests. This work is available to the public for use. It was also published as open source on GitHub.